Coordinated UK Ocean observation: The recent UK Marine Science Strategy provides overall direction for marine science in the UK over the next 15 years. Across the UK there are ongoing developments for well-connected and cost-effective observations on the UK marine environment. The PAP-SO is a key existing observatory taking part in these discussions and future network. UK Strategy is developing in the context of international drivers such as the Oslo and Paris Conventions (OSPAR) and the Marine Strategy Framework Directive (MSFD). The PAP-SO is already a key observatory in the European network Ocean sites and forms a key associated site in the development of the Western Shelf Observatory. A growing need: Sustained time-series datasets from the ocean are essential to assess “good environmental status”of our seas. Science results and outputs from the Porcupine Abyssal Plain sustained Observatory (PAP-SO) have contributed to understand the societal relevance of the North Atlantic on UK waters and European seas. Informing policy: Results from the PAP-SO are used to advise the Department of Environment, Food and Rural Affairs (DEFRA), Marine Climate Change Impacts Partnership (MCCIP), European Parliament and the European Commission (EC) on ocean governance, environmental management, biodiversity in the deep sea, Marine Protected Areas, geoengineering and ocean observatory development. The European context of the PAP-SO within Ocean sites has led to presentations to advisory/expert groups across Europe including the Marine Observation and Data Expert Group (MODEG) of EMODNET, at European meetings including GMES in situ data requirements and at GEO meetings. The PAP-SO is as a key site in GEO-BON (GEO Biodiversity Observatory Network) plans. The PAP observatory is in international waters. Monitoring the open ocean is vital so we can compare trends and changes with coastal waters to predict and plan for future change. Such comparisons have been documented in Charting Progress 2: A UK Assessment of the state of UK seas which was launched on 21st July 2010. The PAP Observatory is a named sustained observation site – search for PAP in the UK Directory of the Marine Observing Systems. 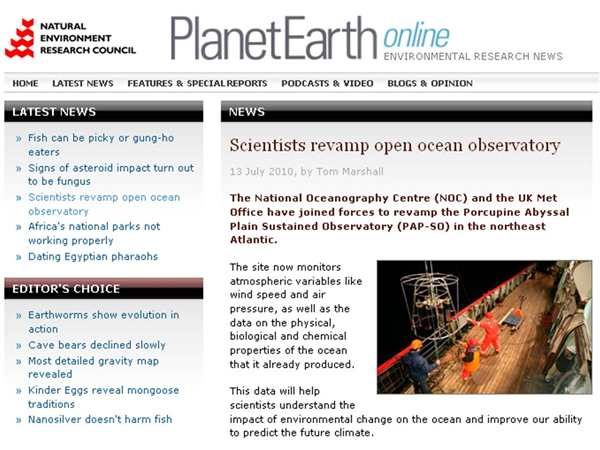 Science communication: PAP research has been reported in various UK popular press and media outputs including NERC Planet Earth online, Oceans2025 magazine, Earthzine, NOCS News and OceanZone (see below and outreach page). The PAP-SO is mentioned as an Oceans2025 Highlight. On 12–13 October, the EurOCEAN 2010 meeting in Ostend brought together the European marine science community to consider, discuss and respond to new policy developments in the sector and highlight challenges and opportunities for their research over the next decade. A European Ocean Observing System was a key priority listed in the Ostend Declaration. Europe calls for a Sustained European Marine Observatory Network. PAP-SO Principal Investigator Richard Lampitt was a key-note speaker at the 2nd ESF Marine Board meeting on 16th September in Brussels. Download the presentations. Read more on the NOC website News. PAP article in NERC Planet Earth online magazine: NERC and UK Met Office join forces for new infrastructure. Earthzine: After OceanObs’09 PAP and EuroSITES coordinators reflect on the societal need for in-water ocean observation: Earthzine Ocean observation online publication.